What Are Investors Getting Wrong About Tesla? 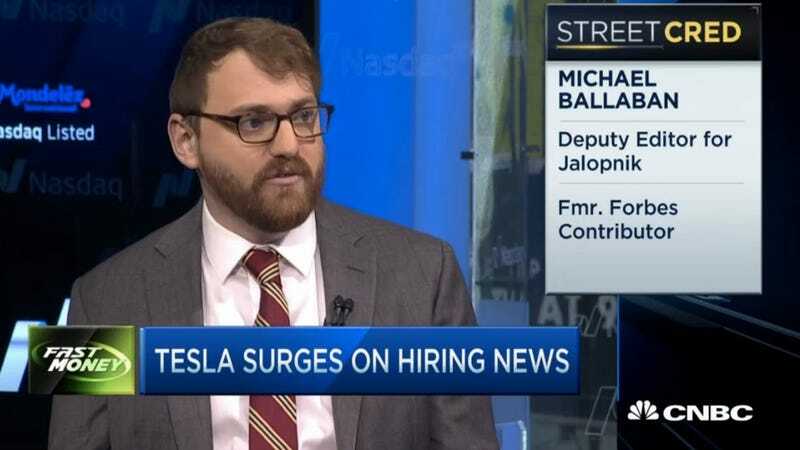 Earlier today, CNBC’s Fast Money invited Jalopnik on the show to talk Tesla Motors, so we drew straws and sent Michael Ballaban—mostly because he was the only one with a clean suit and a trimmed beard. Profitability. Tesla isn’t actually a profitable company just yet, but they have a few years before that becomes a concern for them. Most of their income covers costs and goes directly back into development. Tesla also faces a few hurdles in advancement and growth. Michael brought up the upcoming Model III, which should be big for the company, but will also have to really deliver on the expectation of an affordable fully electric sedan with an extensive range. Tesla’s future is also dependent on consumer acceptance. They currently have no issue with selling vehicles, but only in a relatively supportive and small market and at a cost too large and a practicality too low for most consumers. The main goal of the more affordable Model III is to steal sales from traditional vehicles and get more people open to the thought of owning a fully electric vehicle. Beyond consumer acceptance, Tesla will face more and more competition from companies like Google and Apple (whatever form those will take) which weren’t even in frame just a few years ago. That’s not to mention the fact that almost every major automaker in the market is revolutionizing their development programs towards affordable alternate-fuel and hybrid technology. There’s also a concern over Tesla’s seemingly all-or-nothing approach to autonomy. Will trying to shortcut future competition cost Tesla the middle ground in getting their vehicles into a larger market? The final prompt in our modest segment concerned Tesla’s perception of itself as a tech company and not an automaker, having to overcome concerns a traditional tech company wouldn’t, like exponentially greater safety and legislative requirements and standards to meet. Just recently, they recalled every single one of the Model S vehicles over a minor seat-belt issue. Before the comments fill up with a raging battle over how legitimate Tesla is (they have now successfully brought three models to market, and are currently constructing a $4 billion Gigafactory), or isn’t, I’d like you all to reassure Ballaban that he definitely didn’t look like he was going to throw up.